When it launched Surface RT, Microsoft mentioned that 3 months later it would be bringing out an Ivy Bridge version running Windows 8 Pro. At the end of last year, Microsoft announced pricing for Surface Pro: $899 for the 64GB version and $999 for the 128GB version, both without any bundled touch/type cover. Today we get the missing puzzle piece: availability. Surface Pro will be available in the US and Canada starting on February 9th. Dimensions 10.81 x 6.77 x 0.37" 10.81 x 6.81 x 0.53" 9.50 x 7.31 x 0.37"
- From a distance, Surface Pro looks a lot like Surface RT. You can easily tell the difference in display sharpness compared to Surface RT (1080p vs 1366 x 768 helps), but both sport the same 10.6-inch 16:9 form factor. When viewed head on with the display off, you can't tell it apart from the RT version. I really believe Microsoft settled on the right display size for a notebook/tablet convergence device (although I'm still not sold that this is the ideal aspect ratio). 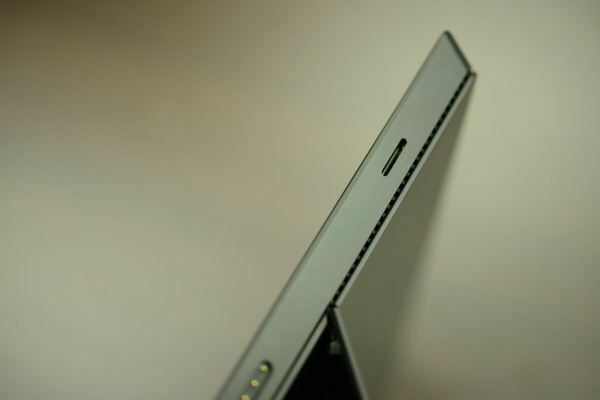 - Surface Pro is definitely thicker and heavier than Surface RT. Microsoft does a good job of masking the weight in both of these devices, but I'd still like to see thinner/lighter versions next round. - I'm not too bothered by Surface Pro's pricing, as it's ultimately an Ultrabook competitor. However I would like to see a bundled touch or type cover at those price points. I'd also like to see integrated Thunderbolt to truly enable the tablet/notebook/desktop usage model. - As I mentioned in the first Surface Pro announcement piece, the tablet uses a 17W Core i5 (Ivy Bridge) SKU. I'm not sure how much we should read into Surface Pro not being a 7W SDP Ivy Bridge launch vehicle. The performance per volume is obviously going to be very good as a result. Microsoft demonstrated content creation and even gaming workloads on the tablet, both of which were very responsive. This is really where I feel Microsoft dropped the ball on not including Thunderbolt, although if all you need is miniDP out then Surface Pro has you covered. If you're fine with an Ultrabook/MacBook Air-class system as your main machine, Surface Pro could really be everything from your tablet to your desktop. - Don't be fooled by the similarities in capacity. Surface Pro uses a full blown SSD, not an eMMC solution for storage. It also features an integrated USB 3.0 port, so IO performance will be notebook-like not tablet-like. - Surface Pro features two fans that are audible under heavy load but attempt to remain as quiet as possible. The fans will adjust their direction of rotation depending on how you're holding the tablet, with the goal of never exhausting warm air into your hands. The vents are located around the top half of the device as you can see in the image above (this separation doesn't exist on Surface RT). - The digitizer that ships with Surface Pro attaches magnetically to the charge port on the tablet. - Surface Pro uses the same type and touch covers as Surface RT. These two remain the best tablet keyboards I've ever used, not in that they are great keyboards but they offer a great balance of usability and form factor. Type/touch cover really do feel like a cover that you never need to remove, whereas most other tablet keyboards make me feel like I've turned my tablet into a notebook. I would still like to see Microsoft take a second pass at the covers though, I feel like there's room for improvement in usability. MS nailed the form factor, now it's time to perfect the keyboard/trackpad functionality. - Surface RT was built from three discrete pieces of VaporMg (injection moulded magnesium): frame, back and kickstand. Surface Pro only needs two: the frame and back are integrated, and the kickstand is the only other discrete piece of VaporMg. The finish feels identical to Surface RT, although the kickstand did feel different to me. I didn't get enough time with the unit to really pinpoint how it was different, I just noticed that something was different. Overall I'm still very impressed with the build quality of Microsoft's Surface devices, if the rest of the Windows RT/8 tablets and notebooks felt like this I'm not sure Microsoft would have needed to build Surface to begin with. - As much as I love the kickstand (all tablets need Surface's kickstand), Microsoft still doesn't have a great solution for in-lap use. The kickstand is workable, but not ideal. I'm not sure if there's even a real mechanical solution to this problem, but I'd love to see one. Overall I'm very excited about Surface Pro. Like Surface RT, I feel like the one that's going to be really exciting is the next generation device though. Without Haswell you lose S0ix and support for ARM-like idle platform power, which I suspect is going to be largely responsible for the "5 hour battery life" claims vs. Surface RT. Anyone shopping for an Ultrabook won't be put off by the battery life, but compared to ARM based tablets it doesn't look good. When you can get Ultrabook/MBA performance and ARM-like idle power however, things get very interesting. The appropriate Haswell parts won't be available until Q3 of this year, making holiday 2013 (or maybe a little sooner) a probable launch for a Surface Pro 2. I'm glad to see Microsoft going down this path. The past few years have been littered with form factor confusion, and while I don't have clear visibility to what will ultimately emerge as the "right" ones, I do believe there's currently room for something in between a tablet and a notebook. Microsoft remains ahead of the curve in building tablet/notebook convergence devices. Unlike Apple however, Microsoft doesn't have the luxury of showing up to an uncrowded market. As a result, Microsoft has to work a lot harder to convince folks that Surface is a platform worth using - the initial flaws are less excusable when the market is full of mature competitors. Basically a $200 price premium over an iPad, and for that you get an actual PC. Real CPU, awesome by tablet standards GPU, SSD, USB 3.0 (versus nothing), displayport, etc. Surface Pro (and other tablet PCs) are why my current iPad will be my last, I presume. - it has fans and yes, you will hear them. - it would nag you to download the latest windows update and restart 2-3 times a week. As a Windows 8 ultrabook it has screen that is too small. And Windows 8 did not improve much in scaling the desktop. Without trackpad to navigate you would need either an external mouse (here goes portability) or use digitizer all the time and it isn't convenient in regular laptop configuration with screen popped up. Security updates for windows are released on the second Tuesday of the month. Non-security updates are usually released on the fourth Tuesday of the month. That is basically once every 2 weeks a bit different to 2-3 times a week. I'm on the fence with Surface Pro. While I'm not interested in the RT version, the Pro really draws my interest. But the shortcomings you state make me hopeful for the next version, and I may hold out for that before I buy in. What should be interesting about Surface devices is that MS can update them whenever they want. I don't know if they will take that approach, but they have off-the-shelf components going into them, so even the 7W* Ivy Bridges could make their way in before too long. Apple has to design its own SOCs, which brings its own risks. MS could use this to their advantage, if only to tier Surface a little better.